Jakarta, June 15th 2015 - Archipelago International has added another hotel to its portfolio in Kalimantan, Borneo. Joining the already-established Aston Balikpapan and favehotel Balikpapan, the new Quest Hotel Balikpapan has officially opened its doors following an opening ceremony initiated by the Mayor of Balikpapan, H.M. Rizal Effendi, who signed the plaque of the new Quest. Quest Hotel Balikpapan is just 10 minutes from Balikpapan's International Airport. It is located on one of the city's most reputable roads, Jalan Jendral Sudirman, right inside Balikpapan's Superblok shopping and entertainment district, which puts guests within walking distance to E-Walk, the biggest shopping mall in Balikpapan, and the city center. 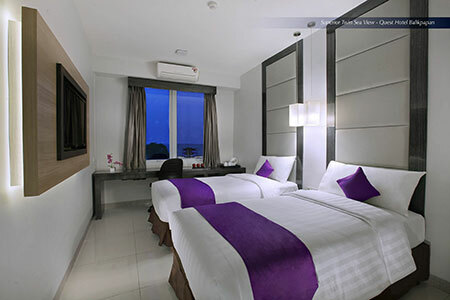 Cool, clean and comfy, Quest Hotel Balikpapan combines the value of a premium, budget hotel with unique, inspiring designs, creative hospitality concepts and state of the art technology. It is an ideal choice for travelers seeking a stylish yet unpretentious environment. Quest Hotel Balikpapan features 79 rooms and suites, each one equipped with an LED flat-screen TV with satellite channels, self-controlled air conditioning, fast and reliable complimentary WiFi, a working desk, standing shower, safety box, hair dryer, mini bar, slippers, coffee & tea makers, and select bathroom amenities. In addition to the premium in-room facilities, Quest Hotel Balikpapan also features a spa and collection of meeting rooms capable of accommodating up to 175 guests. For a quality dining experience, the Meratus Restaurant & Coffee Shop hosts a team of passionate chefs in charge of creating the all-day a la carte menu that covers an array of Indonesian specialties and international comforts for both business soirees and enjoyable family gatherings. "With the high economic growth in Balikpapan and the vast development of the city in almost all sectors, Balikpapan provides great opportunities for Archipelago International hotels. Quest Hotel Balikpapan provides businessmen and women with a stylish and convenient stay without the high price-tag, whilst tourists can enjoy a fantastic address and friendly services in the heart of Balikpapan's attractions." Said Ms. Tenaiya Brookfield, Vice President of Sales and Marketing at Archipelago International. Seen in the image - From left to right Mr. H.M. Rizal Effendi as Mayor of Balikpapan, Ms. Tenaiya Brookfield as Vice President of Sales and Marketing Archipelago International, Ms. Elvina Yahya as Director of PT. 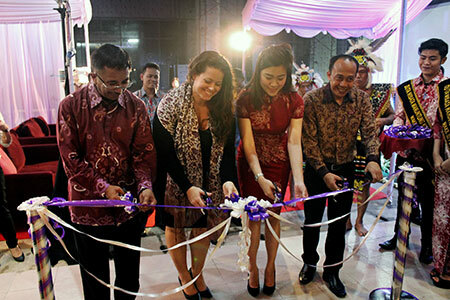 Bina Ruang Indonesia and Mr. Sri Hartoto as General Manager of Quest Hotel Balikpapan cut the ribbon to mark the opening of Quest Hotel Balikpapan. Quest Hotel is Archipelago International's affordable life-style 3 star hotel brand which aims to combine the value of premium budget hotels with unique and inspiring designs, creative hospitality concepts and state of the art technology for travellers seeking a stylish yet unpretentious environment.